The JCCC, Behavior Intervention Team (BIT) was established in 2008. In collaboration with the Student Services and Engagement Division and the JCCC Police department, the BIT was established to enhance the safety to students, staff and faculty of JCCC. 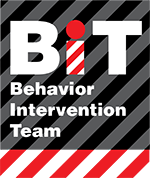 The Behavior Intervention Team (BIT) was formed to provide a centralized team of individuals to assess any danger or harm that may result from the actions of an identified person or persons on any College-owned or College-operated facility or at any College-sponsored event or activity, either on or off campus. Assess the danger or harm that may result from the actions of a person or persons. Engage in risk reduction through assessment of circumstances as reported through various entities of the college. Identify persons who have shown a risk of harm toward others or themselves when associated with JCCC property or activities. Recommend an action plan to curtail any threat or potential danger to people, educational environment or property. Centralize information concerning inappropriate behavior and coordinate appropriate action in case of threat to people, educational environment or property. Communicate with law enforcement when scope of threat is beyond BIT’s scope. The BIT consists of institutional personnel with expertise in human resources/employee assistance, law enforcement/threat assessment/tactical applications, College operations, medical and mental health knowledge, and student services and engagement. Depending on the situation, personnel with areas of specialization or responsibility, or those who have vital information, may be called upon to assist the team. To contact the BIT or for more safety and emergency information, go to KOPS-WATCH.